Createspace Independent Publishing Platform, 9781477453643, 220pp. This is a memoir detailing one man's serendipitous journey from bachelorhood to parenthood. After his latest girlfriend becomes his wife, and his wife becomes pregnant, Tom finds himself a first time father at nearly 50 years old. Over the years, he has shown only a passing interest in his nieces and nephews, and has never touched someone else's poo. Now, with an eight month-old baby and two toddlers, he wracks his brain for any useful cross-over skills accumulated from a half-century of single life. 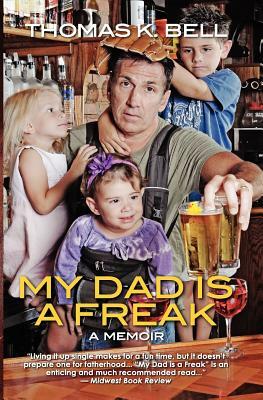 "MY DAD IS A FREAK" is the conclusion that each of his children will inevitably arrive at, in their own good time, despite his best efforts. Tom Bell previously held positions as the publisher, editor, and delivery supervisor of the Colonial Woods Lantern. This one-sheet neighborhood newspaper topped achieved a print run of 47 copies per week at its peak. Mr. Bell was 13 years old at the time.